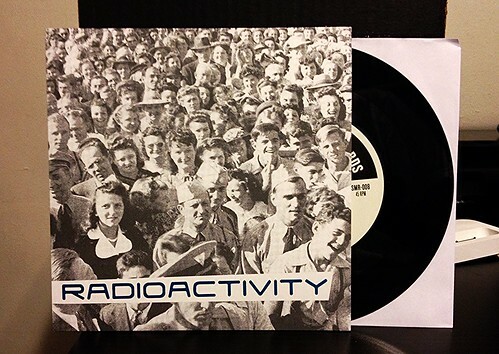 I Buy Way Too Many Records Dot Com: Radioactivity - Danger 7"
There's something to be said for consistency. If you read this website you can count on the fact that I'll only throw around a handful of adjectives. If you watch any of the prequel Star Wars trilogy movies you can count on being in a bad mood afterwards. If you listen to a band that Jeff Burke is singing in (Marked Men, Potential Johns, Novice, Radioactivity) you can absolutely count on that record being spectacular. What you can also count on is consistency in sound. I would never say something cliche like the songs all sound the same, but the songs are all coming from a similar place. Fortunately for me, I could listen to songs from a place like this all day long. Radioactivity, like Burke's other bands, crank out fuzzy, catchy garage pop. They write hooks better than most bands I can think of. Even though the 2 songs on this could probably be considered among their slower or more mid tempo tracks, they are still bristling with energy. Of the two, I prefer the B-side "Why" but both are equally great. Word is another full length is nearing completion and you can count on me to be buying that the very second if goes on sale.